Its Saturday and currenly 2.30pm when writing this post, though in all honesty it feels like it should be 5 or 6pm by this stage because i have been up since 5.30am this morning. My body has gotten used to waking up that early, so i guess thats the time i wake! Though i enjoy my early mornings and early evenings, hahah. Last night i spent the night at my boyfriends and then this morning i left his apartment by 7am ... haha, he hates that i leave so early but i was awake and had planned a workout. So i was at the gym before 8am, when the gym opens and was the first one there. But soon the people crowded in but i got a great workout in before i headed back to my boyfriends apartment and sat in the sun to do some studying, but now for the rest of the day it is going to be a day off from studying - as well as tomorrow. Instead i have set up a plan for the next 2 weeks to get everything done and learnt, but like everyone around me tells me... i need a mental break. And when i reach the stage where i can barely write properly, then i know that i need a break from studying. So my plans for this evening are to go to town with my boyfriend and eat dinner at a restaurant... or we'll return home and make dinner instead, or maybe we wont leave at all... hahah, we're the type of people to make plans and then because its bad weather we decide to just stay indoors anyway, but i dont have a problem with either option! Its nice to allow myself to have some freetime from studying, the worst thing is when i cant study but i want to/need to and then just feel anxious because i amnt doing my work... but when i instead allow myself and decide to not study its easier. I am always like that... i can be really undecisive about things for hours or days, but once i decide on an option then its fine... its just the indecisiveness before hand. Tomorrow i am heading back home again and i am looking forward to next week, it will be alot of studying on my own but i am looking forward to just going for walks and runs and being in my own apartment and making lots of delicious food and getting some routine into my life. For now, its time to put away my computer and be a little social, haha. Using this photo because 1) This was one of the best races i have run. 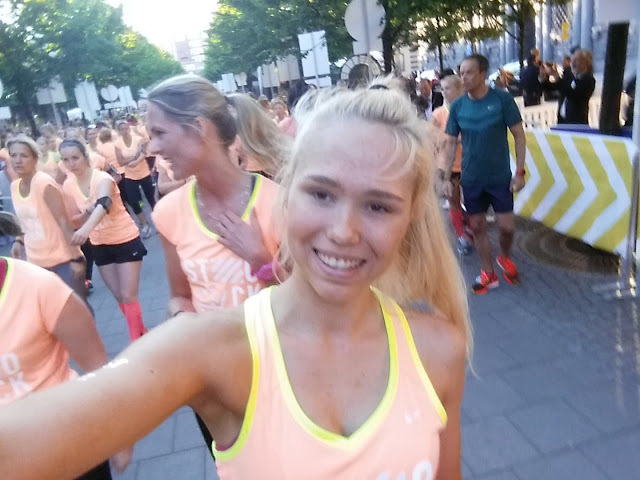 2) I miss summer 3) I miss being tanned 4) It was the womens health half marathon in Stockholm todya and i super jealous that i couldnt run it :( and 5) I cant wait until my lungs begin to co operate and i can run long distance again!!! and 6) Because i felt so happy (and nervous) when this photo was taken. And i want to go back to that happy feeling, for just a few days when i ran this race and travelled to Gothenburg with my boyfriend i felt so happy and not fake happy but truly happy, and i want that again! And i amworking towards it!! Dear Izzy, I am glad you are taking the day off! It sounds like you need to build in more breaks? :-) Very best wishes with the steps towards recovering the happiness deep within. I want to say thank you for how much you have done for me since I started reading your blog. I think I read it mainly because I wanted better eating habits, and it has definitely helped with that, but also with _so_much_ more. I'm grateful for your presence, your "company", your love of excerise, your good sense, strength of character and combination of openness and independence. Planned breaks are always the best - its more structured for you as you know for x amount of time you are not going to study but you are going to do it at y instead - less anxiety.